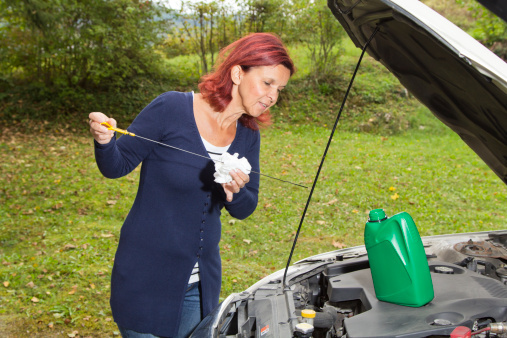 You can change your own oil in these easy steps! Every three thousand miles or three months, it’s suggested that you change the oil in your car. We all know that taking it to a dealership or an auto shop can be expensive after awhile. Oftentimes, they do an excellent job—but is there a more inexpensive way to maintain your car? Make sure your car has remained off for an extended period of time. If not, the oil in your car may be extremely hot and can cause injury. Your oil should be warm but not hot. If you need to, raise your car up using your jack. This can allow for easier access to the parts under your car. Take off the undercover. This will give you access to the oil drain plug and oil filter. Place the oil drip pan under the plug. Position the oil drip pan slightly off to the side because the oil will drip down at an angle. Remove the oil filter cap and drain plug. Using the wrench (and a bit of muscle), remove the filter and plug. Make sure to keep your hand away from the oil’s path to avoid injury. Clean the drain plug while the oil is draining and, when finished, tighten it back into place. Make sure it’s on tight, but not enough to strip it. Remove the oil filter. Reposition the oil drip pan under the filter to catch most of the fluid. Hold the filter over the pan to let the oil run out. Install and tighten the new filter into place. Get a good grip and tighten it well. Make sure the drain bolt and filter are tightened on and pour in the new oil. Pay attention to recommended levels for your vehicle. Remove the jack. Get your car back on an even level before you start it. Start your vehicle and check the oil levels. The oil should be a yellowish tint and at the recommended level that your manufacturer states. Dispose of your oil and parts properly. Most automotive stores will have a place for you to drop off the used oil and parts. All things considered, changing your oil should take no more than 30 minutes. If you’re changing your oil for the first time, make sure you have someone there who knows how to do it. They’ll be able to walk you through if you get stuck.